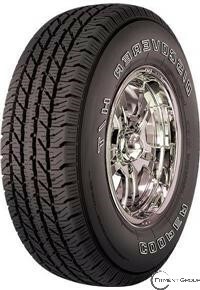 * The Discoverer H/T is Cooper's premium touring SUV/light truck original equipment replacement tire. * It is designed for drivers who want ride comfort, all-season traction and a premium warranty in a highway touring tire. *The Discoverer H/T is suitable for a wide range of vehicles including SUVs, crossovers (CUV) and light trucks, and vans up to 1 ton. * Four Wide, Notched Circumferential Grooves: Offers resistance to hydroplaning, while improving snow traction. Enhances wet traction and winter performance on snow and ice. Delivers greater rubber density on the road, reducing shoulder wear and noise.